Vanilla House has re-invented the apron with our newest pattern launch of Six Corners Apron. With it's curious design, you make it with two right angled panels overlapping each other creating a split-angled bottom edge. 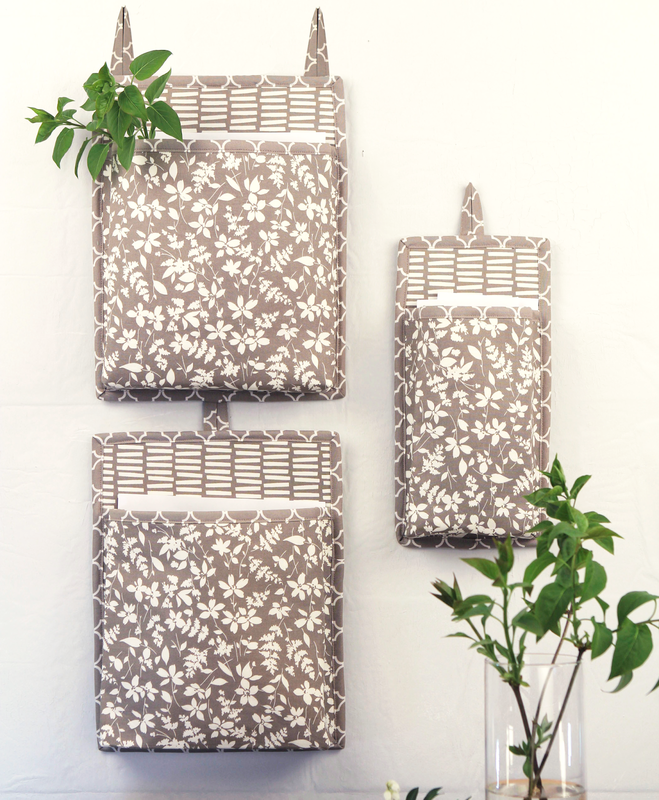 The two panels mirror each other in every way except using coordinating fabrics. Not only is it trendy with it's split-angled bottom edge, it is very stylish and flattering with it's A-line shape. It is a great project for two fabulous pieces of fabric. Learn how to 'bird wing' corners, a technique that is very important on pointed corners like corners 1, 2, 5, and 6. Designer’s Tip: "Whenever you are turning a two-layer arrangement right side out, you need to clip the corners before turning to reduce bulky corners. You can clip straight across but I like another version called ‘bird winging’ the corners. Note the enlargement -- “Do you see the bird wing shape?” Be careful to NOT clip the seam." 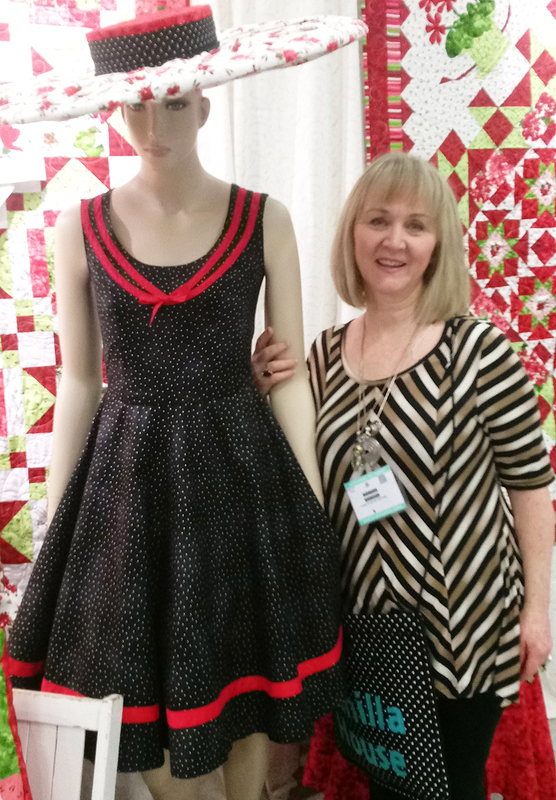 Own Six Corners Apron pattern by sewing and learning and loving the art of apron making today! 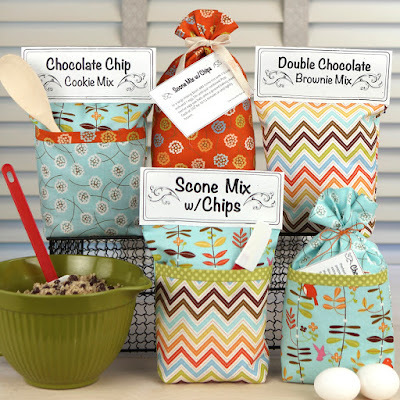 Our Klassy Kitchen pattern offers five projects that are such great gift ideas. Techniques shown in the pattern are well illustrated and easy to make. 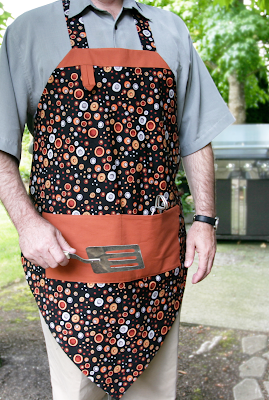 The apron shown below would work well for a hostess gift. The pocket adds tons of accent. 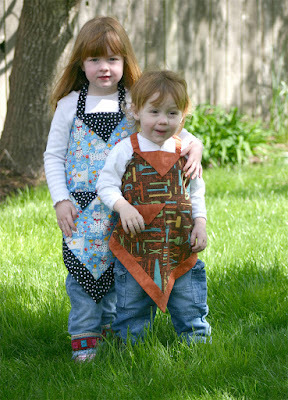 The whole apron maybe takes an hour to make. Handmade place mats, especially for wedding gifts, is always well received. You could add some glassware, silverware, or even some dishes to go with the placemats. 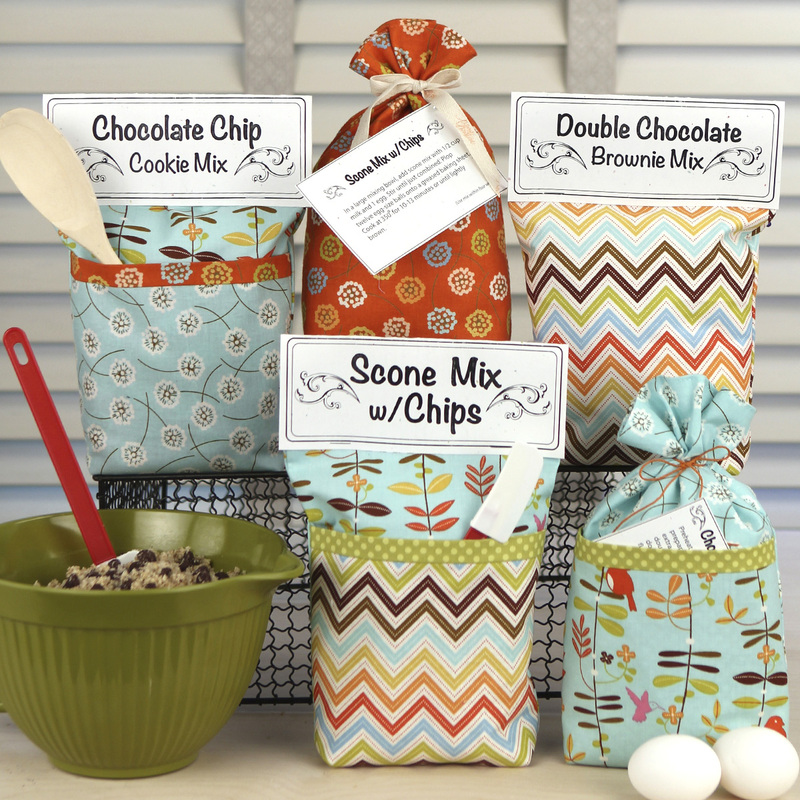 One of Vanilla House's favorite gifts is a mixing bowl, oven mitt, and a gift bag containing Chocolate Chip Cookie Mix. Who wouldn't want that?! 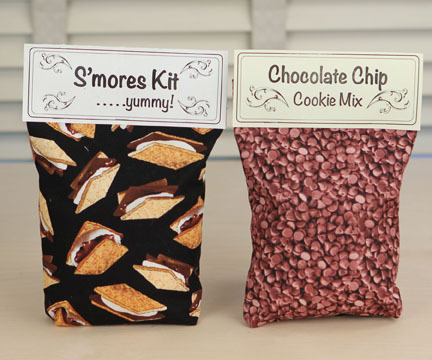 Gift Bag with Chocolate Chip Cookie Mix inside. Printable bag topper included. Last but not least, coordinating an organizational accessory like the Pocket Hangers is always a big hit! Coordinate your Klassy Kitchen -- spectacular in every way! New Santa pattern just in the nick of time! New Santa pattern just in the nick of time for your Christmas parties and gift-giving! 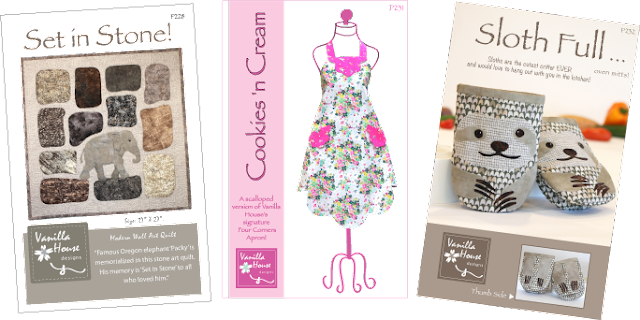 This is yet another version of Vanilla House's signature Four Corners Apron. I love the U-shaped pocket. It really is our easiest and maybe our cutest pocket in our inventory. Sample the perfect DIY holiday gift for neighbors! Not just neighbors, but everyone loves treats for the holidays. But my goodness, they come all at once! 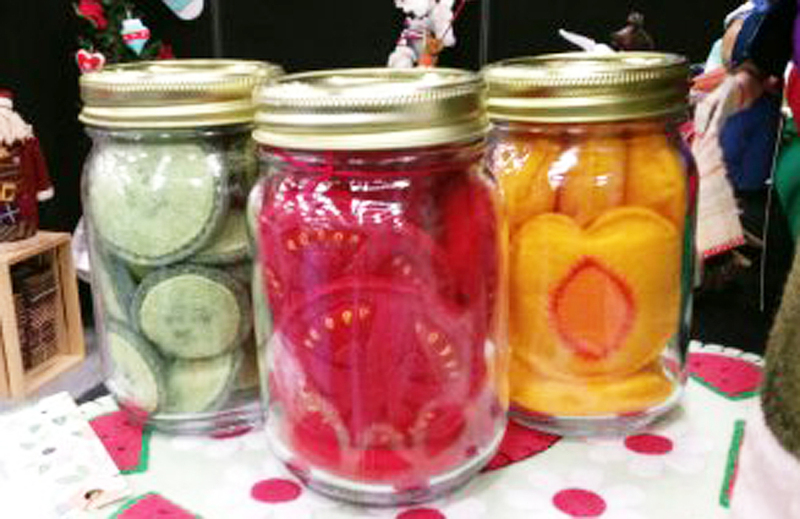 Gift Mixes solves that issue. A treat that can be given during the holiday season-of-giving but cooked at the convenience of the recipient, maybe several weeks later when wishing for one more treat because all the rest are gone! What a great idea! Just to tempt you with a sample of deliciousness, we have a freeby of two dry mix recipes here, expires Nov 19, 2018. If you love the samples, the whole pattern 'Gift Mixes' instructs how to make the fabric bags with bag toppers and/or tags. 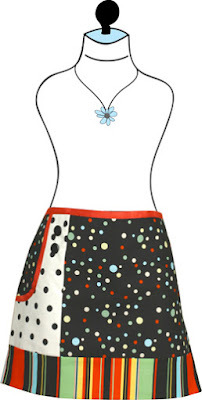 Cookies 'n Cream Apron is simply delicious! Furthering our efforts to publish spin-offs of our famous apron, Four Corners, we have come up with another version of our signature 'square-on-point' apron series. Appropriately named 'Cookies 'n Cream', this version is simply delicious. Maybe the scalloped edges remind you of cookies and cakes covered with cream frosting. Or maybe the scalloped edges resemble lacy doilies under your favorite pastries! 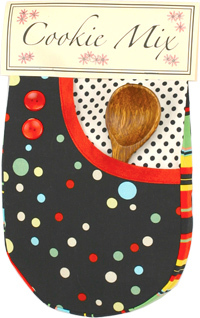 Whatever the connection, we are sure everything you make in this apron will taste delicious! Likes its original counterpart, the apron is lined with a coordinating print that matches the neckline flap, pocket flap, and neck and waistline straps. But different from Four Corners, the neck flap is is made semi-faux. The original Four Corner neckline flap folds over from the back. 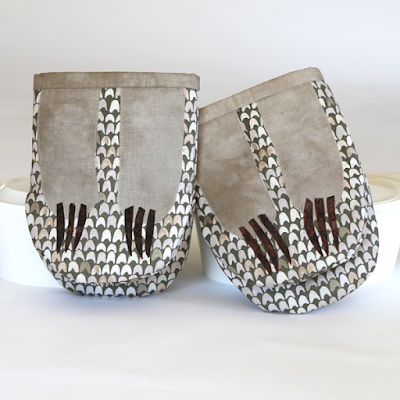 On Cookies 'n Cream, the flap is sewn on separately, and the neck straps are sewn into the seam. Made differently but looks the same. This apron is so easy to make and looks good on every figure. 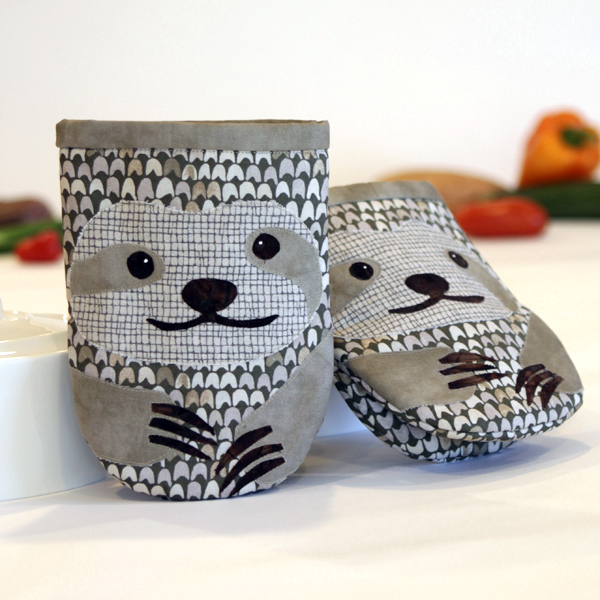 Are you Sloth Full in the Kitchen? Sloths are the cutest critter Ever! And Vanilla House has published a new set of oven mitts with appliques reflecting this latest trend of slothfullness. 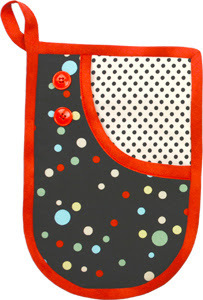 The basic oven mitt itself is wonderful -- easy to assemble and works great -- very comfortable. Soft Fuse Premium fusible web by Shades Textiles for the appliques. We chose this brand for several reasons. Foremost, the paper does not separate from the webbing prematurely. Nothing like having the paper fall off the webbing before you get it cut out. 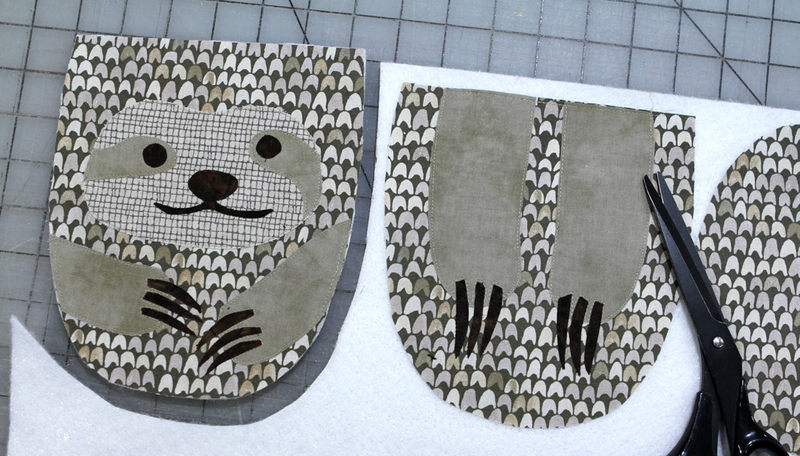 Another huge factor is the paper removes from the webbing easily after you get the applique cut out. 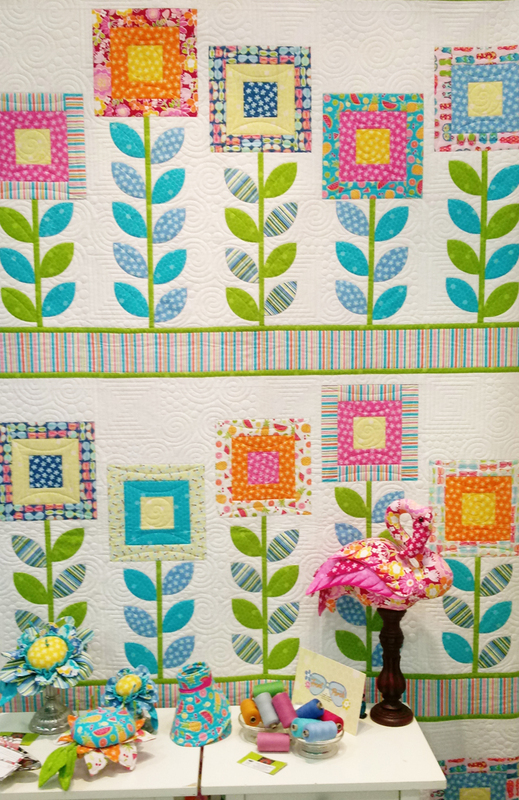 How many hours have you spent trying to get the paper off your fused applique, often destroying your applique in the process? If you fuse as recommended, 3-4 seconds, the paper side comes off easily. We recommend the "scratch in the center of the applique with a pin and use the 'ripped spot' to grab the paper and pull" method. Insul~Bright thermal fleece by The Warm Company. We use this product because we like the metalized polyester film sandwiched between batting layers. The film not only helps prevent the heat transfer to your hand, but the metalized layer helps prevent moisture from penetrating the layers which can facilitate too much heat transfer also. So, good product! We have published more information on Insul~Bright here. The appliques are also easy to add (edge-stitched), the more intriguing part being the 'thumbside' of the mitt which shows the sloths paws and claws. 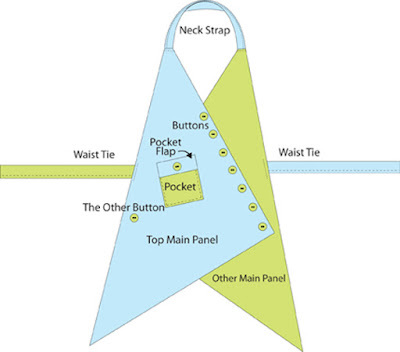 The Original 'Four Corners' apron. What makes a good, well written pattern? A good pattern should be well written, fully illustrated --- meaning illustrations for every step of the project --- and clever construction techniques that make sewing really fun. 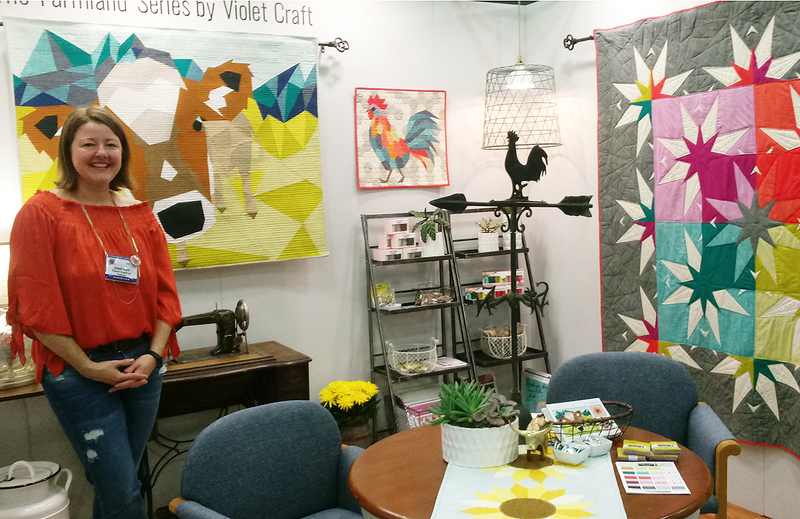 And sewing is more than just sewing these days. 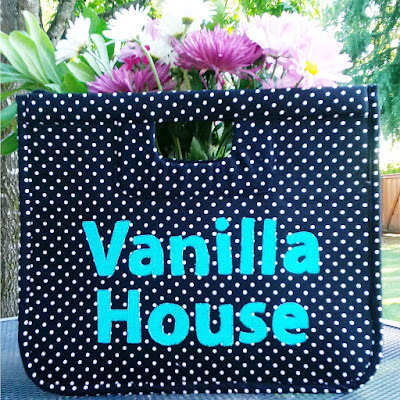 Vanilla House talked with a group of sewers recently and they all agreed they love to learn new techniques as they sew a project as well as ending up with a well-made item without having to spend a ton of time figuring out the instructions. That's why Vanilla House patterns are kind of on the long side --- not because they are 'wordy' but because they are filled with illustrations. We are hoping the understandable illustrations are a 'quick read'. That being said, every year our patterns get better and better --- at least we think so. 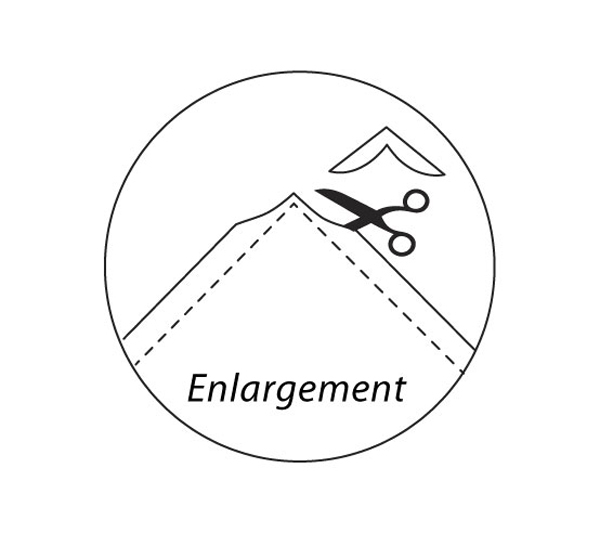 If you purchased one of our earlier patterns, the above definition may not apply as well as current releases. Still not many complaints over the years, so that is a blessing. 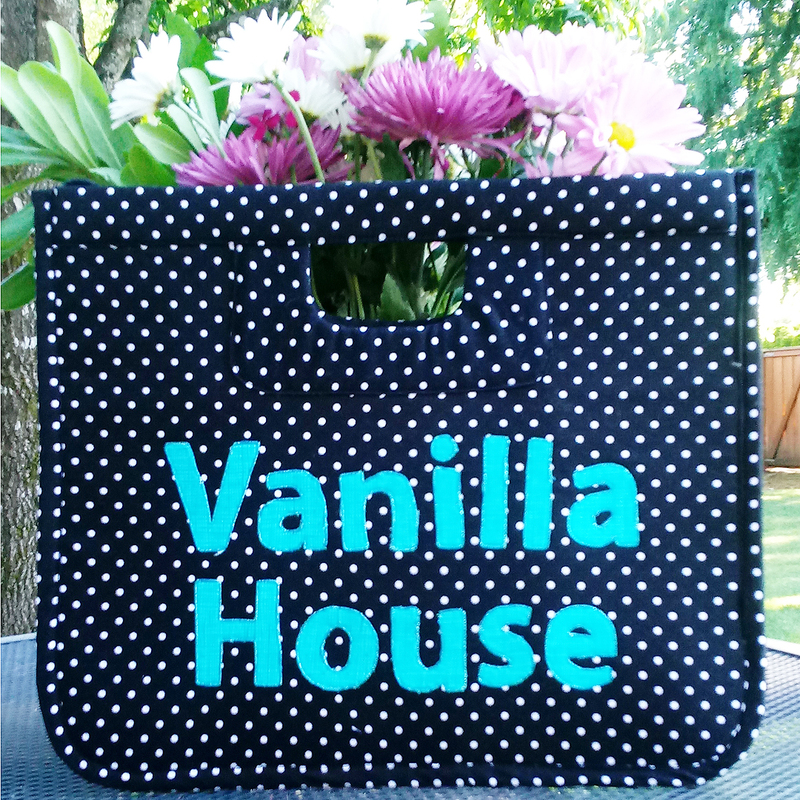 Vanilla House does have two types of patterns these days, the paper versions and the online pdf downloads. The paper versions use black, white, grey, and textured illustrations where the online versions are in color. In our opinion, the color versions are a little easier to comprehend the concepts being illustrated. Editors are also an important part of pattern writing. I remember my first editor, Debbie Soelberg. She was awesome and probably taught me more about technical writing then my college English professors. Her big deal with me was consistency within the pattern. For example, if you write a technique in one spot in the pattern, keep the same terminology throughout the rest of the pattern (ie. call it rst or RST or right sides together through out the pattern). The example seems obvious but some newbie pattern writers are all over the place and their patterns are a night mare. However it is handled, a good pattern has threads that weave the whole pattern together. It makes it easier to read and to understand. I also had a editor who previously worked for McCalls Pattern Company as an editor. She was set in her McCall pattern method of writing and was not open-minded enough to see anything but their style of construction. That really left me out of being able to create new and interesting techniques. One thing I have learned, there is more, and in fact many ways to construct a project. McCalls constructs patterns so they are easy to write. I construct patterns so they are easy to sew. That does mean the techniques are sometimes harder to write, but it is worth it. The whole point of being an independent pattern designer is the large arena for creativity in your construction process. 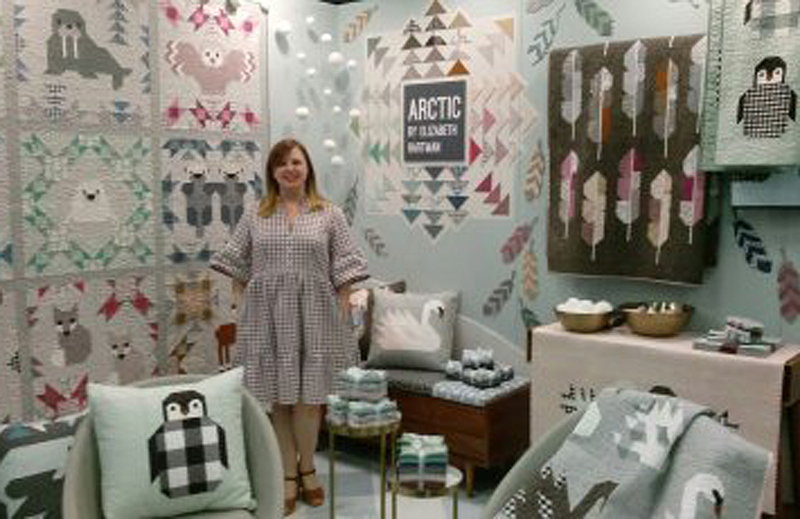 Once you figure out a creative technique, experienced pattern writers will figure out the best way to convey the process. It is interesting to note that even with editors, mistakes still show up in the patterns. After all these years, I currently do not have editors but I edit the [darn] things about a hundred times before I publish. Still miss stuff but not as much as when I had editors, so there you are. Most honest pattern designers will have a correction site on the internet or some process to convey the slip-ups. Oven mitts, hot pads, and casserole covers are popular projects using Insul-Bright Thermal Batting from The Warm Co. We started using Insul-Bright a few years ago and discovered the real scoop on the product. We do love it but there are some tips you should know. The biggest tip is really ironic ---- don't iron or press it too much. We discovered this by pressing a layer of Insul-Bright onto cotton fabric during one of our sewing projects. Then we pressed them -- mostly out of habit to simply press everything. With a really hot iron, the Insul-Bright seems to shrink up a bit causing the cotton fabric to distort or ripple. Insul-Bright reflects heat back from a its layer of metalized polyester film sandwiched between layers of polyester fibers. It's meant for holding onto hot things from the oven for rather brief periods of time, not the firm, intense heat of an iron. So if you need to iron/press any part of a project containing Insul-Bright, go lightly and it will solve the problem. These oven mitt panels have fusible web on the back side. Fuse them to the Insul-Bright lightly -- 3 to 4 seconds per spot. The other curious thing about Insul-Bright is one layer is not enough to protect you from the heat source. Even they say so. You can use one layer of Insul-Bright on the 'back of hand' and 'thumb side' of an oven mitt, but in the 'mouth' part (the part of an oven mitt that comes into contact with a heat source and protects you from it), you should always use two layers. The Warm Co. recommends using one layer of Insul-Bright and one layer of cotton batting like Warm 'n Natural Cotton Batting. It is fine to do so, but when writing my patterns, it is too much of a hassle to write in this extra feature. So in the case of an oven mitt, I just have you cut two layers of Insul-Bright and it works fine. You might ask 'why not use two layers on all panels?' --- well, it simply gets too think to sew all the layers together. Some other helpful suggestions. 1-Insul-Bright does not have a right or wrong side. 2-You can pre-wash it, but I never do and it seems fine. It does wash well inside your oven mitt if you choose to wash them. 3-You can not use Insul-Bright for microwave projects and is too noisy for clothing. 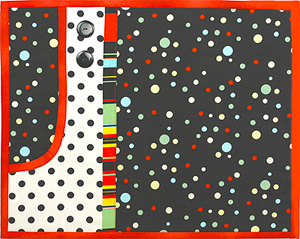 4- But the noisy part of Insul-Bright can make interesting stuffed toys or soft books for babies. 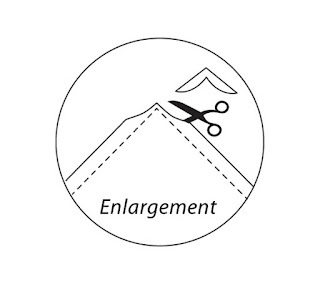 5- Use zig zag stitching for sewing layers together -- it smashes down the edges so the seams allowances are easier to work with, especially if you are sewing bias binding around the edges. 6-Set your cut oven mitt panels on the sheet of Insul-Bright and use the panels as templates to cut out your Insul-Bright. Use the oven mitt panels as templates instead of the paper templates -- a much simpler and neater method. Wall Buckets - a one or two loop soul? Everyone is 'organizing' this time of year. Maybe Wall Buckets can help. I photo-shopped my cover photo to show how TWO loops might look. So if you are making Wall Buckets, try adding a second loop; I think the bucket will be more stable on the wall. Wall Buckets - P218. Are you a one or two loop soul? 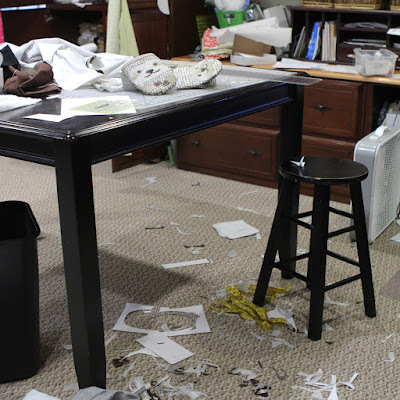 I see all these 'pretty' pictures online of sewers' studio space all neat and tidy and guess what, I don't believe it! A real sewing studio should be a mess. 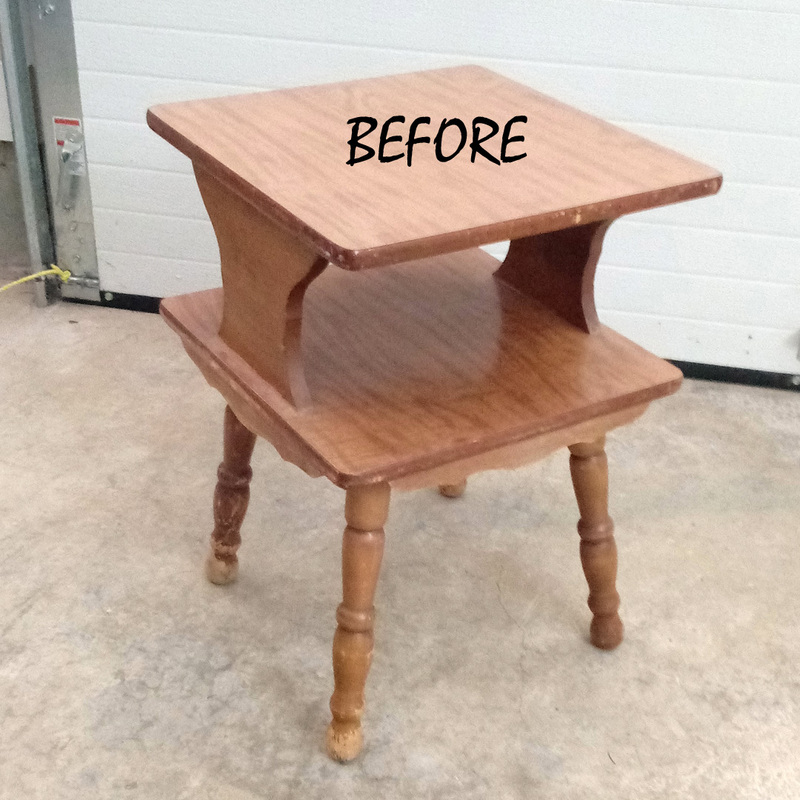 Here is another Before and After project. The most interesting part on this project is the fact that the 'Before' has a laminate top. I previously thought you could not spray over a laminate but in turns out that it works pretty well. The trick is to rough up the laminate surface with a coarse sand paper like an 80 grit on the laminate parts. Use a higher grit like 200 on the rest of the wooden parts. 1 - Use 80 grit sand paper on the laminate parts. 2 - Use 200 grit to sand the wooden parts. [Wrap the sand paper around the leg and clench with your hand and go round and forth to get the legs sanded.] I actually removed the legs on this item and worked on them separately. 3 - Clean the entire item. First dust off with a soft brush, then vacuum, then use rubbing alcohol on a clean rag to remove all remaining dust. 4 - Spray the entire item with spray paint primer (Zinssor makes some good ones). Allow to dry. Use steel wool to sand the entire item. Clean with Step 3 techniques again (always use Step 3 cleaning techniques between each spray coat). 5 - Spray a second coat of primer. Allow to dry. Sand with steel wool and clean again. 6 - Spray with desired color of spray paint -- a very, very light coat -- not even getting close to covering the item color underneath. Keep the spray paint can away about 10" and move around quickly but smoothly. Never allow the spray paint to focus in one spot. Allow to dry. Sand with steel wool and clean again. 7 - Continue to add coats of spray paint -- a very light coat each time -- allowing to dry, sanding with steel wool, and cleaning each time. This might take up to 5 or 6 coats. 8 - The final coat should complete the color coverage. After wards, with the finest of steel wool, lightly sand the project. Wipe with a clean cloth and You're Done! 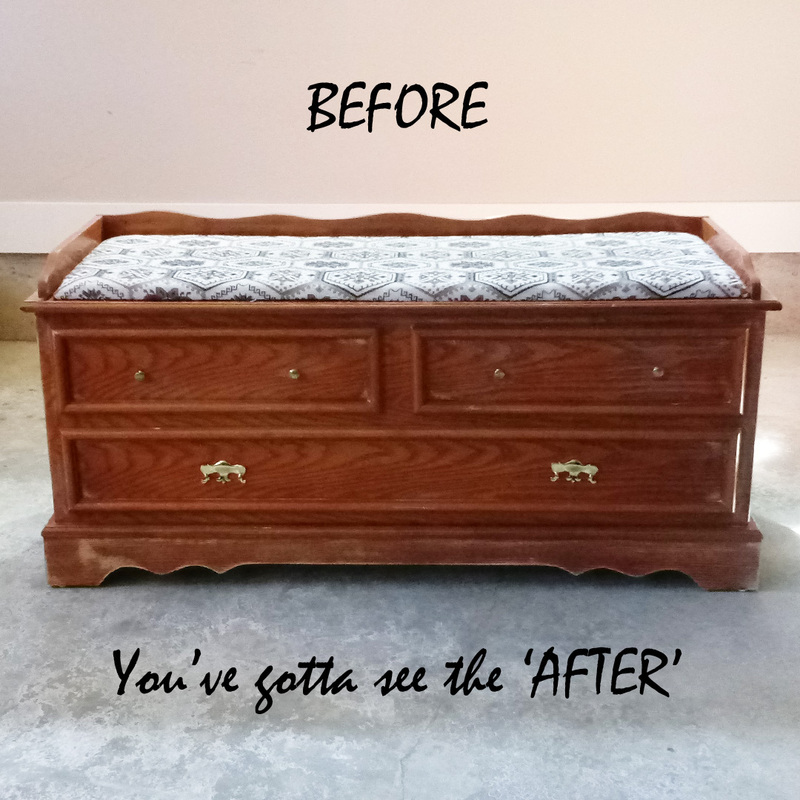 BEFORE and AFTERs - Repurposing with Purpose! I usually try to re-purpose with hardly spending any money at all. This first project was a little more involved and costs more than I usually spend but I look at it as learning costs -- which is actually well spent money. I bought this cedar trunk from a neighbor for $25. I also spent about $50 in chemicals to refinish. And another $25 on the hardware. Guessing here - could even be more on the chemicals -- simply trying lots of different methods. The learning aspect on this project is my efforts to cover up the oak grain. I tried many different techniques so the products needed for each technique added up. But I wanted to learn my favorite on a piece of furniture before I take on something like my kitchen cabinetry. Here is the 'BEFORE'. Wow! Big difference! 1 - Remove all hardware. I also removed the top and top frame but I sure could see the pad with some really funky fabric looking pretty good too. 2 - De-gloss the varnish. You can try to use a varnish stripper, but with some of de-glossers on the market today, it is easier just to paint over a de-glossed varnish. 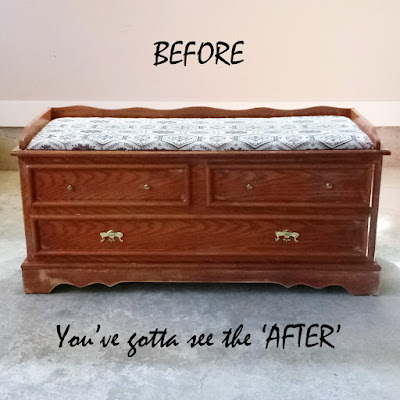 (I used Jasco's Liquid Sander Paint Etcher - unfortunately, it may be discontinued). 3 - After following the instructions of your de-glosser, sand the heck out of the project with a 80 grit sandpaper. 4 - Clean. First, dust it off with a soft brush, then vacuum, then wipe any remaining dust with a clean cloth with alcohol on it. 5 - Paint with Zinssor's Cover Stain Primer (comes in a spray can but with a project this size, you would need a lot of cans -- kind of expensive). I used a good quality, soft paint brush. Allow to dry and clean as in step 4. 6 - Sand again with 150 grit sand paper. 7 - Clean again as in step 4. 8 - Keep repeating the Zinssor's Primer, sanding (drop to a 200 grit sand paper), and cleaning until you feel the grain is disappearing. 8.5 - If you have any spots where you feel you just can't make the grain dissappear, scrap into the grain some Dap Drydex spackling using Bondo Spreader tools. There are other good grain filler products but don't use a 2-part epoxy filler -- way too much work and too hard. Dap Drydex is not a very hard filler, but it is easy to use and when you have lots of coats of primer and paint over it, it works great for projects that won't get wet (ie. don't use on kitchen cabinets). 9 - When you fill you are pretty close to covering the grain, you can paint your final coats of color paint, two or three coats. Sand with steel wool between coats, again, use the agressive cleaning techniques in step 4. 10 - After the final coat, lightly buff with steel wool and wipe with a clean cloth. 11 - New hardware and You're Done! BEFORE and AFTER -- file cabinet! I almost threw out this ugly little file cabinet but sure glad I didn't. 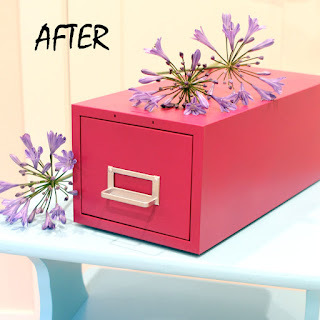 It was an easy project and I think the AFTER looks adorable. 2 - Spray with desired color of spray paint -- a very, very light coat -- not even getting close to covering the item color underneath. 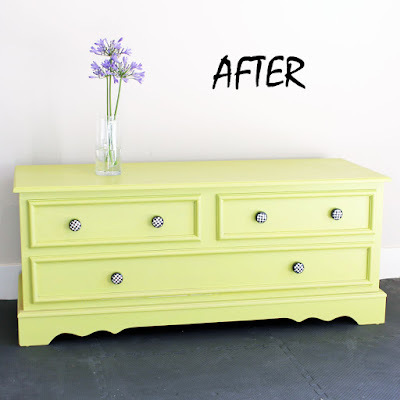 Keep the spray paint can away about 10" and move around quickly but smoothly. Never allow the spray paint to focus in one spot. Allow to dry. Sand with steel wool and clean again. 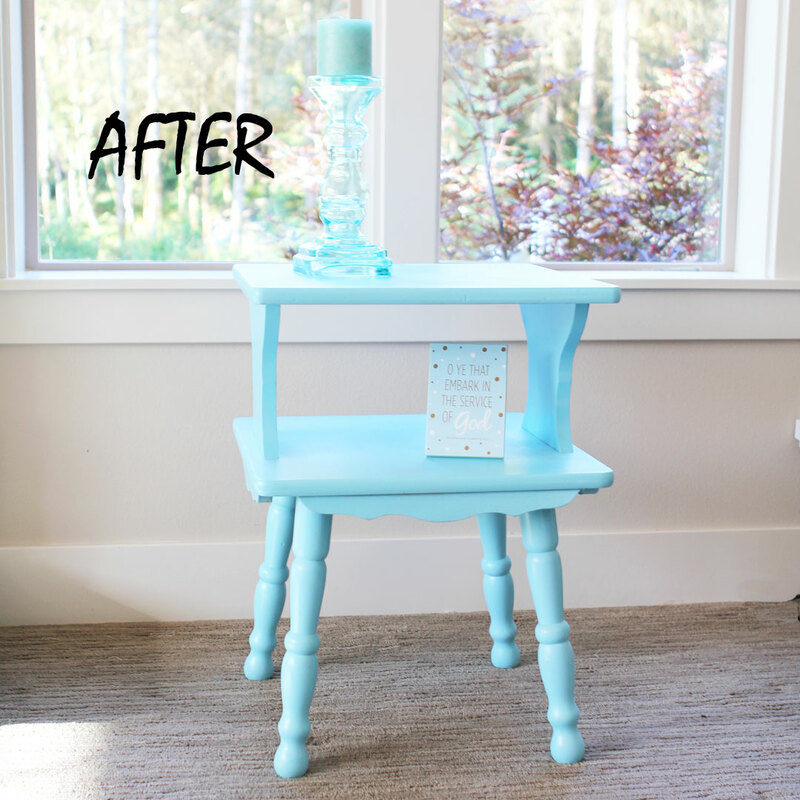 3 - Continue to add coats of spray paint -- a very light coat each time -- allowing to dry, sanding with steel wool, and cleaning each time. This might take up to 5 or 7 coats. 4 - The final coat should complete the color coverage. Allow to dry. After wards, with the finest of steel wool, lightly sand the project. Wipe with a clean cloth. 5 - When completely dry, tape off the handle part with frog tape. 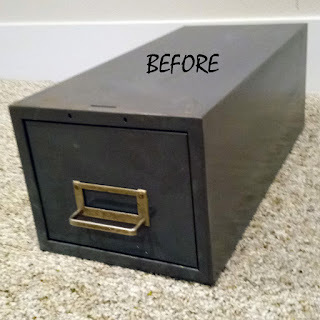 Slip a piece of card board in the file name slot place. Using a silver marker (or other metal color), paint the handle parts. Allow to dry, remove tape, and You're Done!